When you go fishing, you not only want to make a fat catch but you also want to have fun. Fishing has become more interesting with the latest technologies like the Lowrance HDS-7 Gen3 that attract even those who never liked it before. Fishfinders, in particular, have been evolving and getting the right one can be such a daunting task. 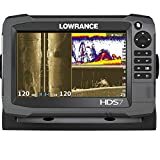 It is due to this that the Lowrance HDS 7 Gen3 review is aimed at providing the information you need before you go fishing. This unit has been made through integrated technology to ensure quality service and easier marine and inland fishing. See some of its listed features below that guarantee ultimate satisfaction to the users. Sometimes we are too bored to press the keypads while other times it is just what we want. HDS 7 GEN3 provides an improved interface for both touchscreen and keypads options. The user, therefore, chooses their preferred option and just in case one fails, then there is the option of the other. No worry therefore if the screen gets insensitive or hangs which can hardly be experienced anyway. Doesn’t that sound good? The unit also has advanced technology that allows one to have a clear view of the fish underneath the boat and also sideways. View CHIRP and structure scan sonar provide the best 2D and 3D view of the fish anywhere under the waters. The CHIRP technology provides excellent details in extremely deep waters and is also good in terms of marking and differentiating fish and structure. In-depth penetration, therefore, shouldn’t be an issue with this technology. HDS-7 GEN3 has been equipped with an inbuilt GPS antenna thus making it easy to track your position. Navigation can only get better with the internal GPS antenna that has 10Hz position update rate providing accurate trails and also very smooth chart performances. In addition, it guarantees for ultra-accurate positions. As if that is not enough, it supports corrections for WAAS/EGNOS/MSAS. However far you may trail into the sea/ocean, the GPS will keep your trail without the need for an external antenna. The built-in Insight USA charts for coastal and inland US waters also allows for easier navigation. Its extensive mapping options make the better unit for anyone in any part of the world since it also has a world background reference map which is compatible with most cartography in the market. It also allows for a multi-view and sharing of the charts such that one can have a view of two charts at ago. The greatness of this technology mentioned in the Lowrance HDS 7 GEN3 review is its wireless connectivity. Its Go Free wireless feature allows you to purchase, download and upload maps and use them immediately. Apart from maps, you can also download other soft wares and interesting fishing apps that make your fishing experience richer and more interesting. The digital shopping experience enhanced by the Lawrance Go Free app is one of a kind that you do not want to miss. The seven-inch gadget has a widescreen making the display better and easier to see. It is easy to use it due to its touch and keypad options. It is reliable and resistant to water. Dual SD card slots to allow for more storage space. Integrated wireless connectivity allowing you to stay connected all through. Is the unit water resistant? Several people have asked this question and the answer to it is yes. The product is indeed water resistant. Is it sensitive to salt water? While other people have been worried about the product’s sensitivity to salty water, no need to worry since it functions normally in such conditions. Does it work in other areas worldwide besides the US? It works in other places although one may have to acquire a data card for the area they are in. Can one buy the unit without the transducer? Yes, one can be refunded the money for the transducer if they do not need it. 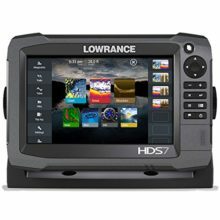 After carefully weighing the pros and cons in Lowrance HDS 7 GEN3 review, it is clear that the unit is of proven quality and has been rated as one of the best by most people who have acquired it already. Its technology has proved to be one of the best and it more than a finding tool that combines work and fun. However, a lower price would enable more people to acquire the product since its price is not as affordable even though its quality is worth the price. Nevertheless, a lower price will increase the sales thus boosting the profits for Lowrance. This Lowrance HDS 7 GEN3 review will, therefore, help you in the decision-making process.